I could never be a teacher – schools are too hectic these days. If you aren’t getting forced out of your job by some not-so-low-key racism from the PTA, then you’re being sexually assaulted by students. That’s South Africa, though – the United States have their own issues, ranging from frequent school shootings to this teacher at a southeast Los Angeles high school who lost it with a student. 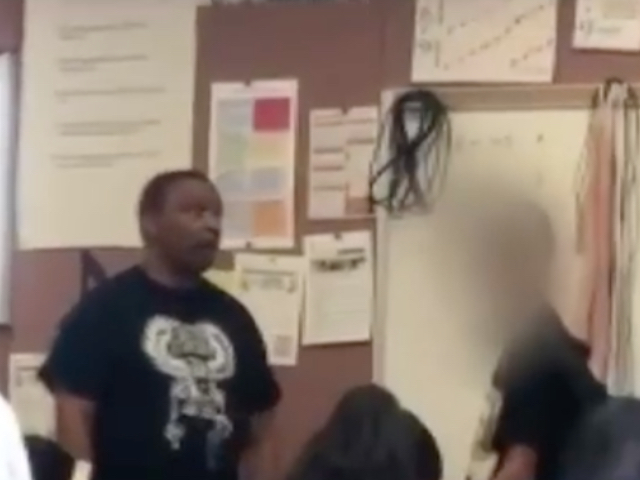 The footage from CNN shows Maywood Academy High School music teacher Marston Riley, 64, standing face to face with a 14-year-old boy at the front of a classroom. Riley then punches the child, launching a cross-classroom fist fight. The brawl was broken apart by students and a campus resource officer. Even after people try to intervene, Riley continues to go after the boy. Students told KTLA the fight began after Riley asked the student to leave the class because he wasn’t wearing the proper uniform. The boy refused, students said, and video taken by another student shows the boy shouting profanity and a racial slur at Riley, who is black. The boy, who has not been identified, was taken to a local hospital where he was treated for moderate injuries and later released, according to a news release from the Los Angeles County Sheriff’s Department. Riley was arrested on charges of child abuse, the release said. He posted bond and was released Saturday. Riley has an arraignment scheduled for November 30. Provoked or not, you can’t hit a kid like that. Teacher COULD not probably handle the offence tirade -and snapped. Nothing to do but apologise I guess…But jeez he must have been angry at the kid.